Romantic cupcakes are a delicious treat on Valentines Day or anytime you want to surprise someone special. While you can always frost a cupcake with pink frosting and sprinkle on a couple of heart shaped candies for quick decorations, romantic cupcakes do not necessarily need to be pink or feminine. Take the intended recipient's personal tastes into consideration when choosing cupcake and frosting flavors. Decorate romantic cupcakes with fresh rose petals. Assemble a heart shaped box full of mini chocolate cupcakes as a romantic gift. Candy boxes are available at party supply stores or candy stores. Bake approximately 16 mini chocolate cupcakes in brown or red paper liners. Cover each cupcake with chocolate frosting and arrange them in the candy box. Decorate each cupcake with a different type of candy to represent different types of chocolates in the box. Examples include red foil covered hearts, truffles, conversation heart candies, marshmallow hearts, Valentine candy corn or any type of pink and red candies. Use your imagination to create patterns and visual interest with the various types of candies. Recreate conversation heart candies in cupcake form with silicone heart shaped baking cups. Bake the cupcakes and allow them to cool completely. Frost cupcakes green, yellow, pink, white and purple with tinted frosting. Pipe sayings and words such as, "Be Mine," "Kisses" or "Love" on the frosted cupcakes with red icing. If you do not have heart shaped silicone baking cups, top regular frosted cupcakes with heart shaped decorated cookies instead. Craft a wedding cake on a miniature scale by stacking a mini cupcake on top of a full-size cupcake. Remove any paper wrappers first and join the cupcakes together with buttercream frosting or royal icing. Place the miniature cakes on a wire rack over a sheet pan and pour melted chocolate or Candy Melts over the cakes to completely cover them. Let the chocolate harden and pipe frosting decorations of your choice onto each cake. Top each cake with a candy clay rose. Keep your romantic cupcakes simple by topping frosted cupcakes with sugared rose petals. 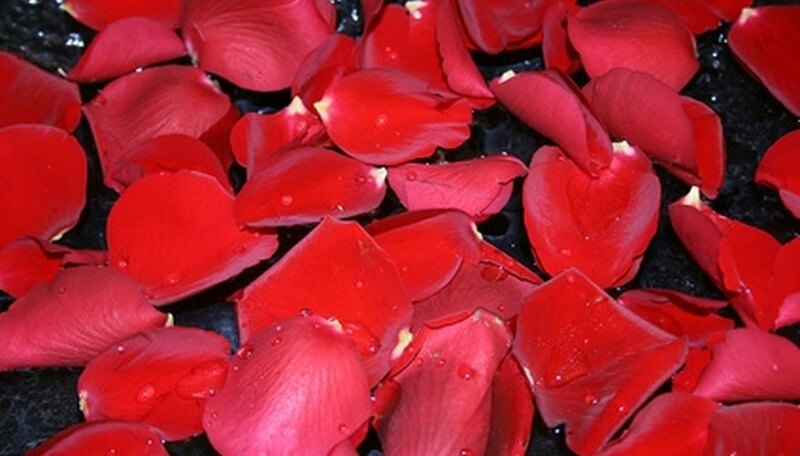 Brush pesticide free rose petals with corn syrup and gently toss them in white sugar. Sprinkle two or three sugared rose petals onto each frosted cupcake. Pesticide free rose petals are sold in health food stores and some grocery stores as edible rose petals. You may also be able to purchase edible rose petals from some florists. McCoy, Kittie. "Romantic Cupcake Decorating Ideas." Dating Tips - Match.com, https://datingtips.match.com/romantic-cupcake-decorating-ideas-6331232.html. Accessed 23 April 2019.